"Punch" is based on dialogue between Punch himself and the various characters. It is absolutely flexible, and can be made to suit your own taste, working area and time. It can be as traditional or as up to date as you wish. The Punch "whistle" (as it is called in America) or "swazzle" (British). Further illustrated details show you how to work or manipulate the figures. A section on Novelty Scenes gives you many more ideas. 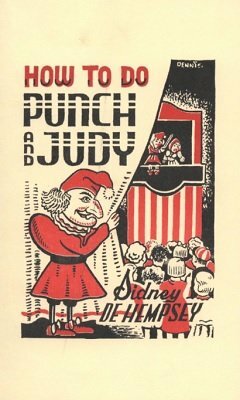 Also included -- a short history of Punch and Judy. Funny, comedy lines, insults, braggadocio, fights! Wonderful chases! Exciting action! Punch, the "bad guy" seems to win every time! But in the end he gets his just reward. The wildest, most dynamic show one man can present. There is no entertainment, for its size, that is as fun and excitement packed as Punch. 1st edition 1977, 106 pages; 1st digital edition 2018, 64 pages.